This no-fuss recipe makes an amazingly soft and spongy pumpkin bread with a sweet swirl of cream cheese in the middle. Perfect for fall! When I first started this food blog in 2014, I finally made good on all the talk about “pumpkin flavored everything” with an absolute classic: cream cheese pumpkin bread. I’ll admit I dragged my feet a little on taking the plunge, since The Husband wasn’t a fan of pumpkin. And, honestly, I wasn’t even sure how I felt about pumpkin. I thought I liked the taste of it, but I honestly couldn’t remember the last time I had it – which, sadly, means that whenever that was it obviously wasn’t that memorable (hard to believe, I know). Somehow or another I had managed to get through 30+ years of life without ever paths with a pumpkin dessert, and yet every year I hear everyone raving about it. I guess that’s why it intrigued me, that little voice in my head nagging me to try it. I had to know what all the fuss was about. Since this was a new recipe for me, I was going to play it safe and make something basic. I almost always do this because I think it’s the best way to learn, to build a solid foundation so you can work your way toward more advanced things. Gotta learn to walk before you can run, right? But on that fateful day three years ago I woke up feeling adventurous. Like I wanted to push my limits a bit. Maybe take a few risks. So I went totally crazy and not only made pumpkin bread, but cream cheese filled pumpkin bread. I know, I know, I was completely out of control. Someone should have hosed me down. I even told the dogs that I was making my first pumpkin-flavored holiday treat. As you can see, they were thrilled. But seriously, this recipe? And all my musings about whether or not pumpkin is worth the hype? I’m so completely glad I changed it with my budding baking skills. In fact, I’ve made this pumpkin bread for the past three years. It’s just that good. 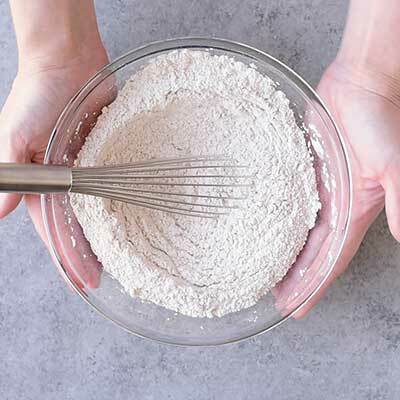 This recipe doesn’t call for yeast or require a fancy mixer – all you need is a bowl, a whisk, and a little elbow grease – so it’s easy to throw together. The cream cheese filling smelled like eggnog (so in other words, delicious) and it took all my willpower not to eat it right out of the bowl. And speaking of smells, every corner of my house was filled with the essence of fall while this bread baked. As for how this bread turned out? Once it had baked and cooled, it was so moist and spongy – which is everything you want in a freshly homemade bread. I remember being totally shocked that I actually made this. And it wasn’t hard at all! Thanks to this bread, once I discovered what baking with pumpkin was like, I wanted to put pumpkin in everything. All year long. No shame. Heck, I still want to put pumpkin in everything. I’ve been trying to sell The Husband on pumpkin and steak, but so far, no luck. Can pumpkin bread be frozen? When properly stored, pumpkin bread will keep it’s “best” quality for about two or three months. After that point, the texture of the bread might change, but it will remain good for up to six months frozen. Can you swirl the cream cheese layer? Absolutely! Just use a knife to gently drag and bob through the batter (careful not to scrape the sides or bottom!) once all the layers are assembled. This recipe has changed over the years, primarily because I learned how to properly measure flour. I know it doesn’t seem like much, but it can make a huge difference! You can read more about how to measure flour (and other common ingredients) here: Measuring 101. Over the years, I’ve slowly adapted this recipe to better suit my baking methods and tastes. If you’ve made this bread before and want to make the original version, you can find a similar recipe here. Step 1 – In a large bowl, whisk together the cream cheese, sugar, flour, and egg until smooth and creamy. Set this bowl aside for now. Step 2 – In another large bowl, mix the dry ingredients: flour, sugar, pumpkin pie spice, baking soda, baking powder, and salt. Step 3 – In (yet another!) large bowl, mix the pumpkin puree, brown sugar, vegetable oil, sour cream, vanilla extract, and egg until nice and smooth. Step 4 – Add the dry ingredients into the bowl with the pumpkin mixture, then use a spatula to fold them together until combined. Step 5 – Spray a 9x5 bread loaf pan with cooking spray, then scoop in about 1/2 of the pumpkin batter. Use a spatula to spread it into an even layer. Next, pour in all of the cream cheese mixture on top of the pumpkin, smoothing out this layer as well. Finish off by adding the remaining 1/2 of the pumpkin batter on top of the cream cheese. Use a spatula to make the top nice and even. Step 7 – Let cool, then cut and enjoy! This post was originally published on October 16, 2014. It was updated with new photos, revised recipe, and video on October 30, 2017. In a large bowl, whisk together cream cheese, sugar, flour, and egg until smooth. Consistency should be thick; when you raise the whisk, none of the cream cheese mixture should easily drip off. If it does, add another 1 tablespoon of flour and mix well. Set bowl aside. Preheat the oven to 350 degrees. Spray the 9x5 bread loaf pan with baking spray, then set aside. In a large bowl, sift together flour, sugar, pumpkin pie spice, baking soda, baking powder, and salt until combined. Set bowl aside. In another large bowl, whisk pumpkin puree, brown sugar, vegetable oil, sour cream, vanilla extract, and egg until smooth. Pour the sifted dry ingredients in with the wet, using a spatula to gently toss and stir, being sure to scrape the sides of the bowl. Mix until just combined and dry ingredients are no longer visible. Pour 1/2 of the pumpkin batter into the prepared bread pan, pushing batter into corners and smoothing with a spatula. Next, pour the cream cheese filling into the pan, smoothing out the filing with a spatula. Do not worry about pressing into corners. Finally, pour the remaining pumpkin batter on top of the filling and gently pull & spread to cover the sides and corners, careful not to disturb the cream cheese layer beneath. Be sure pumpkin layer completely covers the cream cheese layer. Let baked cream cheese pumpkin bread cool in the pan for 15 minutes, then transfer to a wire cooling rack to cool completely. Slice pumpkin bread and serve immediately. Bread be can stored on the counter for 1 week in an airtight container, or in the freezer for up to 6 months. Pumpkin bread is one of my favorites in the fall, that cream cheese swirl sounds amazing! I just got two of them into the oven and cannot wait! I added walnuts to one and the other I left as is! Let you know when they’re done. I absolutely LOVE pumpkin bread, especially when it’s stuffed with a layer of cheesecake! This looks so delicious! Loved your recipe! I sprinkled some cinnamon and sugar on top before I baked it and it was yummy! Thanks for sharing! Hi there i plan to make this tonight!! I have a question though how much cream cheese do you use, i know it says 8oz cream cheese but in the video there seems to be more than one block? It’s 8 oz 😀 I think it might just look like more because of how it was cut and put in the bowl. This was really good! I used 1.5 tsp of pumpkin pie spice and I swirled the cream cheese. It took over an hour to bake. I’ll definitely make this again. Would it be possible to use 1 can of pumpkin puree (15oz) and double the recipe for the batter? I think one can equals to about 2 cups. Would it be necessary to double the cream cheese filling then? Thanks!